So You Think You Know How to Best Experience Niagara Falls? Seeing Niagara will never quite be the same. That's what happens when the author of nine books about Niagara Falls talks with 40,000 tourists from the around the world, then shapes his findings into a new work that pinpoints the 10 best ways to experience the falls. We know what you're thinking. You probably assume any Western New Yorker who has made numerous trips to the falls over the years already knows how to best "soak up" the power and majesty of this world-renowned attraction. 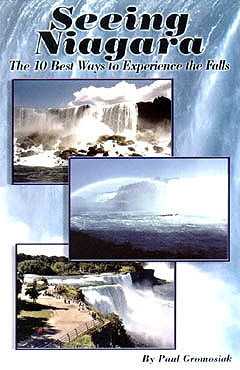 But even readers who think they have the falls' experience down to a tee will be pleasantly surprised as they page through Seeing Niagara. Paul Gromosiak goes far beyond just listing awesome spots that visitors shouldn't miss. The book combines color photographs, intriguing historical facts, maps and riveting true stories into a user-friendly guide. Readers will learn about daredevils, rockslides, Indian lore and impressive engineering feats. Gromosiak, a lifelong Niagara Falls resident and retired teacher, combed documents, interviewed newsmakers, talked with tourists and snapped many photographs in his quest to capture the history and beauty of the falls.